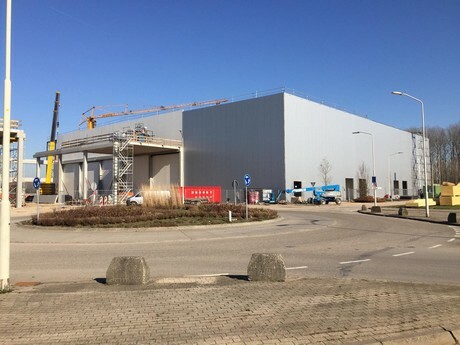 Although Koelcentrum Zederik started as a cold store for apples and pears 20 years ago, the company has finished the construction of a new cold store this year, meaning it’s headed in the direction of a service provider more and more. Originally started as a transport company, Koelcentrum Zederik has been making quite a name for itself as a cold store. The cold store in Tienhoven was built first, followed by a cold store in Groot Ammers to meet increasing demand for conditioned storage in 2005. In 2013, the Groot Ammers branch was expanded to realise a larger cooling capacity. Both locations have a total capacity of more than 20 million kilos of Dutch product. The new location in Gorinchem offers customers of Koelcentrum Zederik everything under one roof: bundling storage, ripening, sorting, packing and shipping facilities. Additionally, imported fruit is also cooled and stored. Logistics manager Mark de Hoop mentions that the seasons of Dutch fruit and imported fruit are starting to be in each other’s way a bit. This is the reason Koelcentrum Zederik has realised a new cold store in Gorinchem, which is meant for the company’s import branch. Because of this, the branches in Tienhoven and Groot Ammers will have more capacity for long-term storage of Dutch fruit. The new building, centrally located on the A15 motorway, has a surface of 13,000 square metres and a capacity for 10,000 pallets. The building will also offer room to subsidiary Zederik Verpakking BV, a specialist in cardboard boxes and punnets. Besides boxes and punnets, Zederik Verpakking now also supplies dozens of cargoes to a large number of customers every day. 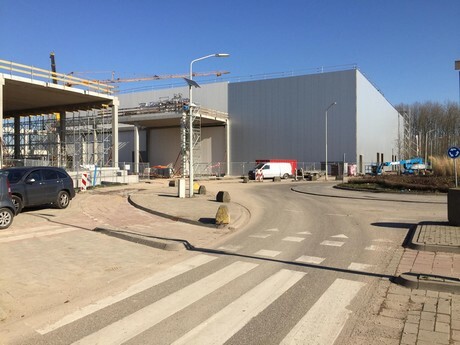 It’s expected that the first containers of imported bananas will arrive in Gorinchem in April, so that all systems can be tested before the new building is officially taken into use. Koelcentrum Zederik is traditionally mostly focused on top fruit, and they’re particularly specialised in Conference pears. In Gorinchem, the fruit storage will be much more extensive than just top fruit. “We can place anything our customers offer for storage,” Mark says. That includes citrus and ginger, but also mangoes, avocados and grapes, for instance. “We have a drying wall in a ripening cell for ginger, which means we can store the ginger very well.” The temperature in the various cooling chambers can be individually adjusted so that each fruit variety can be stored under optimal conditions. The chambers offer the option of monitoring for ethylene besides atmospheric humidity, CO2 and oxygen, and to automatically make adjustments in order to protect the fruit against unwanted ripening. Koelcentrum Zederik is very focused on cost price. “We keep everything under our own control, and we research everything from the fork-lift truck to the racks to the passenger lift, and even the tiles on the floor are internally picked,” Mark explains. This focus on cost efficiency is a connecting thread throughout our entire management. “That’s something we care about a lot.” Koelcentrum Zederik is striving to take an extra step regarding quality and service, and to keep prices at a level in line with the prevailing market. The new facilities in Gorinchem also mean new activities. Although focus was mostly on supermarket units in the past, Mark now expects to pack more fruit in consumer units such as punnets, bags and trays. “I can see it happening that we’ll become more of a complete service provider for our customers in the coming years, and that they’ll be able to put the entire process into our hands.” Mark doesn’t rule out that in future, services are expanded even more towards, for example, transport or stock management for customers and order filling on behalf of customers. But focus is first on getting the new building operational and getting the accompanying figures in the black. Unburdening customers is an important aspect in operational management of Koelcentrum Zederik, and Mark has noticed that their customers increasingly need that as well. “I’ve seen customers who are increasingly limited to buying and selling, and they prefer one party to take care of everything, and we think we can play a part in that.” Koelcentrum Zederik is striving to grow along with its customers. Mark observes that a shift from wholesale customers to supermarkets has become visible in recent years, and as a result, Zederik now handles more consumer units as well, and they pack and sort more specifically for supermarkets now as well. Koelcentrum Zederik was started as a family company. The family is still involved in the company, and the culture within the company is that of a family company as well. Because of that, employees are involved and stay with the company for long periods. “One of the most important causes of our success is that we hire good people and manage to keep them, and that they’re all interested in going in the same direction.” They don’t just strive for lasting internal relationships, the relationships with customers are also long-term. “With a stable clientele it’s easier to make new investments,” Mark says. “We’re striving for an open relationship with our customers.” The cold store enjoys thinking with their customers, so they can both achieve maximum profits.